Over the course of 2015 I've found some really fantastic authors that I've fallen immediately in love with. With most of these authors, I've only read one of their books, but this post is all about the ones I've recently discovered and which of those authors I'd be most likely to continue reading. Let me know in the comments below which of these authors you like, or don't like, and which books you've read that are written by them! Or, tell me which authors you've discovered in 2015 that you think have become favourites! Below they are in no particular order. Sabaa Tahir (found through An Ember in the Ashes) Sabaa Tahir grew up in California’s Mojave Desert at her family’s 18-room motel. There, she spent her time devouring fantasy novels, raiding her brother’s comic book stash and playing guitar badly. She began writing An Ember in the Ashes while working nights as a newspaper editor. She likes thunderous indie rock, garish socks and all things nerd. 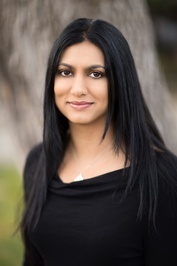 Sabaa currently lives in the San Francisco Bay Area with her family. After seeing quite a lot of hype surrounding this author, I scoured far and wide for a copy of An Ember in the Ashes for less than $40 (because I was too stubborn to order it from Book Depository and wait a couple of weeks for it to arrive.) When I did find a copy, it was the Australian (or maybe the English version, I'm not sure) but it was beautiful and I ended up preferring it to the copy I'd seen floating around on Instagram. Once I started it, I literally could not put it down. I took the book to work, to read in waiting rooms, in a laundromat, made myself sick in car rides, and finished it sitting in a parking lot waiting for Josh to finish work. Sabaa Tahir's writing style blew me away, it really introduced me to this new world and made me completely understand it, I cannot wait for the sequel. 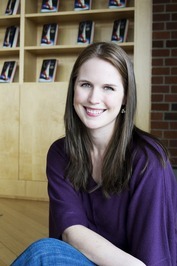 Marissa Meyer (found through The Lunar Chronicles Series) I live in Tacoma, Washington, with my fiancé and our two cats. In addition to my slight obsession with books and writing, I'm big on road-tripping, wine-tasting, and hunting for antiques. I'm represented by Jill Grinberg. I attended Pacific Lutheran University where I sorted mail that came to the dorm, carted tables and chairs around campus, and took writing classes, eventually earning a Bachelor’s degree in Creative Writing and Children’s Literature. Knowing I wanted a career in books, I would also go on to receive a Master’s degree in Publishing from Pace University. After graduation, I worked as an editor in Seattle for a while before becoming a freelance typesetter and proofreader. Another set of books I found through hype. These books were plastered all over Instagram, Twitter, and Tumblr so I pretty much had to read them. I've always been a fan of fairy tale retellings, so Meyer's idea of connecting them all in a futuristic/fairy tale/sci-fi/dystopion-ish setting really caught my attention. I read the first three books and the prequel in about a month (which, considering I was at University, is pretty darn good!) Even though I found the first book, Cinder, quite predictable, I loved all the characters in the series, and still do! I didn't feel that any were one dimensional and though some parts of Meyer's writing styles irked me, I still really enjoyed the series and cannot wait for Winter! Sarah J Maas (found through the Throne of Glass series) Sarah lives in Bucks County, PA, and over the years, she has developed an unhealthy appreciation for Disney movies and bad pop music. She adores fairy tales and ballet, drinks too much tea, and watches an ungodly amount of TV. When she's not busy writing, she can be found exploring the historic and beautiful Pennsylvania countryside with her husband and canine companion. It would seem that a lot of the authors on this list were found because of the fact that they were popular and showed their faces all over social media, and Sarah J Maas is no exception, in fact, she's the author that might be most recommended of the year. I quite literally could not go on Tumblr without seeing edits/chat posts/lengthy conversations as to which 'team' people were on. I had decided that I would wait until the entire series was out before giving it a go... yeah, that didn't happen. It was because of my friend Lauren (you'd know her as @fictiontea on Instagram) that I decided I couldn't actually wait. Thank goodness for Lauren, once I had started Throne of Glass I couldn't put it down. Maas' writing style is so flawless and I could suddenly see why she was so popular everywhere. I've read a couple of books this year where an author will end a chapter on a very well thought out line or something that is far more well-written than the rest of the chapter in order for that line to become something people write on walls, show up on merchandise, and that will become what's written in bios on Instagram, but Maas wrote brilliantly without having to force it, her writing is incredibly 'quotable' without trying to be... I don't know if that description made any sense, basically, her writing is beautiful, enough said. 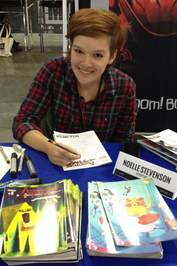 Noelle Stevenson (found through the Lumberjanes comics)* Noelle Stevenson is a comic artist and freelance illustrator residing in Los Angeles, California. She is currently working on her first comic, NIMONA, which is being serialized online and will be published by HarperCollins as a young adult graphic novel in the spring of 2015. She has been nominated for a Harvey Award, and was awarded the Slate Cartoonist Studio Prize for Best Webcomic in 2012. She is a graduate of the Maryland Institute College of Art and has done published work for BOOM! Studios, Random House, MacMillan Press, and What Pumpkin Studios, among others. She is the co-writer of LUMBERJANES, a comic series from BOOM! Box, and has done writing work for Frederator's BRAVEST WARRIORS as well. *I acknowledge that Noelle Stevenson is not the only writer of the Lumberjanes comics, but could not find a lot of information on Grace Ellis! If you have any information on Grace Ellis that I could add to this post, let me know in the comments below! I am not a comic person, not that I don't appreciate comics, I definitely do, but I've never seen myself sitting down and reading a comic and I certainly didn't see myself counting down the days until the next one in the series was releasing... I was wrong, oh so wrong. I had heard about the Lumberjanes comics on Tumblr, but it was never really insanely hyped. It wasn't until I was introduced to Scribd that I found them and had the chance to actually take a look for myself (you can read more about Scribd, which is pretty much Netflix for books, here). All I really knew about the comics was that they were awesome and had a lot of female badass-ery. Since the first ten comic books were already up for free on Scribd, why not? I seriously raced through those comics, laughing like a total idiot the entire time. My fiancé, kept asking me what was so funny and at times I was laughing so hard I could only show him, his response was "You're nuts" but in an affectionate way for sure. After finishing the first ten on Scribd, I went and spent $40 downloading the remaining comics (and Nimona, because who could resist?) that have been published and finished them all within 12 hours of starting the comics and now I'm counting down to November 18th, when the next one will be out. Rebecca James (found through Cooper Bartholomew is Dead) Rebecca James is the author of BEAUTIFUL MALICE, SWEET DAMAGE and the forthcoming COOPER BARTHOLOMEW IS DEAD. She has worked as a waitress, a kitchen designer, an English teacher in both Indonesia and Japan, a barmaid, and (most memorably) a mini-cab telephone-operator in London. 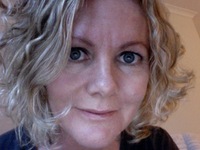 Rebecca lives in Canberra, Australia, with her partner and their four sons. Cooper Bartholomew is Dead is a book I will sing about until the cows come home. I think I've established to my readers how I found this book about 1,000 times but I'll say it again: It was sitting in a bargain bin for $9... Who can resist a good bargain? When I saw it was a book that not only jumped between POVs but also jumped time as well, I had already written it off in my mind as a DNF... NOPE. This book turned out to be one of my favourites of the year simply because the writing style was so interesting and that it grabbed me, and continued to reel me in throughout the entirety of the story. I've written an entire review on this book that can be found under the 'reviews' tab, but it definitely made me want to read more books written by this author. The book certainly wasn't flawless, and I definitely could have liked it so much because I did have quite low expectations... However, it is a good book that I'd recommend to those who love contemporary love stories/a bit of crime for good measure! I've heard quite a bit about Beautiful Malice by Rebecca James that seems to be receiving raving reviews, so it's currently on my TBR! And that's the end of my list! I hope you enjoyed reading which of the authors that I've read for the first time this year grasped me enough to want to keep reading their books. As some of you may have noticed, I've changed Wednesdays from Wanderlust Wednesday to a day of lists (top 5 and top 10) so if you have any suggestions of things you'd like to see me write about or share with you all, make sure to leave them in the comments below (I really love reading your comments) and don't forget to subscribe.